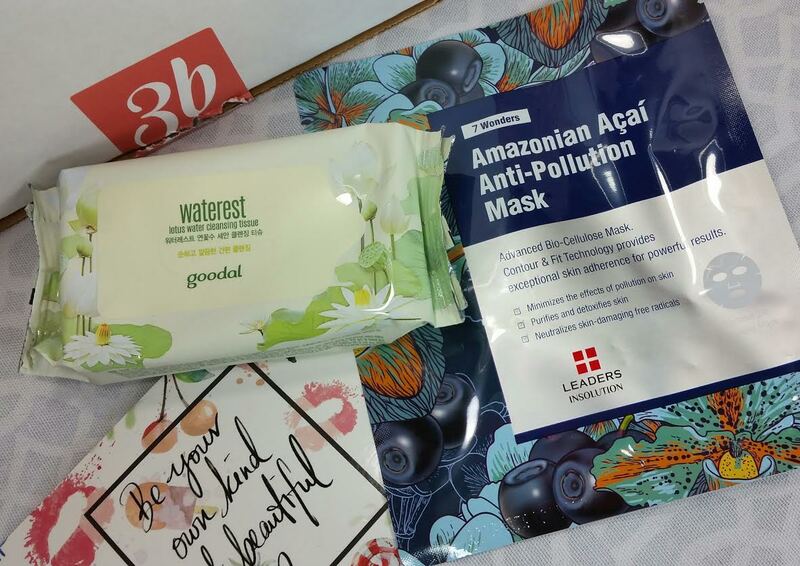 The 3B Box has been doing a great job of providing fun, new and interesting beauty products from Korea, Taiwan and Japan. 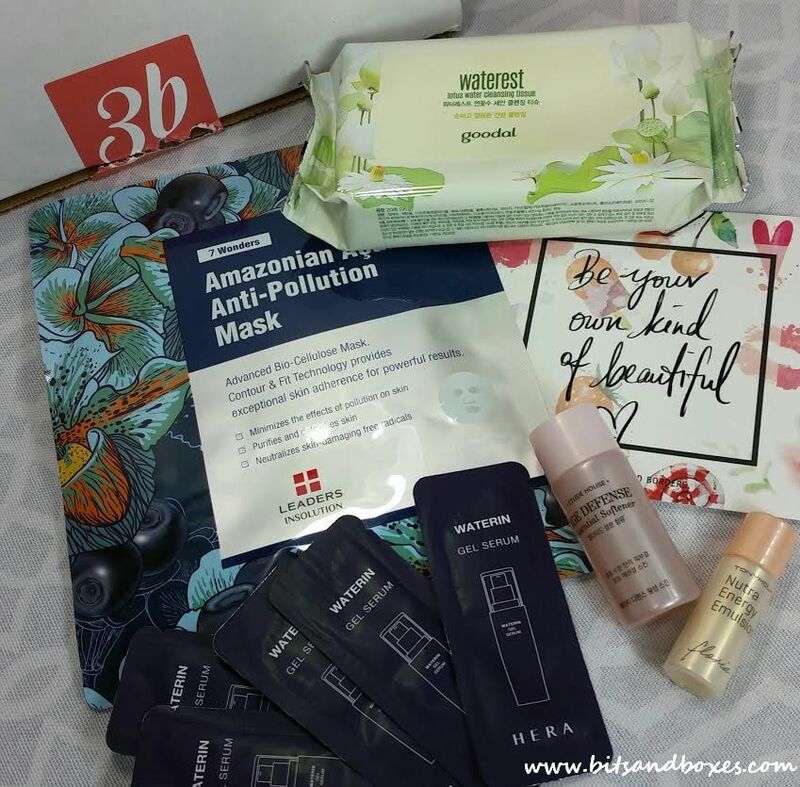 The August 2016 box has some of my favorite brands and, lucky for me, I haven't tried any of them yet! Sometimes, since I have a slight obsession with good Asian skincare, it can be hard to get something I haven't used before. This month is awesome! Everything arrives in a gauze pouch along with an information card describing what you've received and how to use it. This is essential for boxes dealing with foreign beauty products because many times you can't read the instructions. My only wish is that one day they will also list the ingredients on the card, as well. Goodal Lotus Water Cleansing Tissue- I'm sure I've mentioned it before but I hate washing my face over the sink. I double cleanse in the shower but otherwise I use tissues like these or my handy dandy Dr. Jart Micro Water. After researching, though, the second ingredient of these wipes is ethanol. Ethanol is alcohol. Alcohol causes skin cell death and it's especially drying for my already dry skin. So, SADLY, I have to avoid these in order to keep my skin healthy. I'm so bummed. I expect better from the Goodal brand. 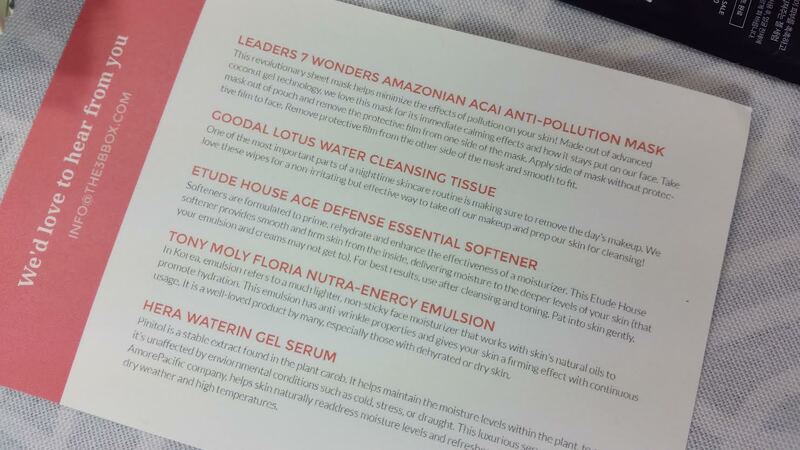 Leaders 7 Wonders Amazonian Acai Anti-Pollution Mask- This is a gel mask which I personally prefer. They stick really well to my face and I feel like they aren't as drippy. Now, while I don't put much stock into "anti-pollution," I do appreciate the action packed antioxidants and moisturizing power of the ingredients (they're in English, yay!). Leaders is one of my favorite mask brands and I'm always, always happy to have more. Tony Moly Floria Nutra-Energy Emulsion- Now this I will try! It's a light moisurizer (emulsion) with glycerin, safflower oil and shea butter. It's also got a bunch of antioxidants in the form of flower extracts, some peptides and sodium hyaluronate. Etude House Age Defense Essential Softener- While Etude House is well known for it's adorable packaging and k-pop star faces, their skincare is really... well, blah. The second ingredient in this moisturizer is alcohol (want to read up about alcohol and your skin? here is a quickie). I'm so disappointed because it has such great other ingredients like arginine, niacinamide and lactobacilius ferment. Someone young probably wouldn't mind but when you get to my age, everything counts. 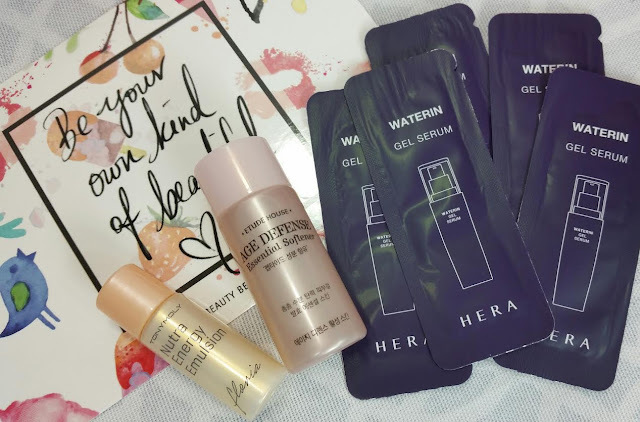 Hera Waterin Gel Serum- This serum is a moisturizer using glycerin and an interesting ingredient called Biosaccharide Gum-1. This is a anti-irritation skin conditioning agent that binds water to the epidermis and creates a moisture-binding film on the skin that gives the skin a soft, smooth feeling. I'm *definitely* trying this since my skin needs all the moisture it can get. I almost hope I don't like it though because it's pretty expensive. I'm glad they included a bunch. VERDICT: One day I should take a picture of my mask stash and horrify you with how many I have to use even though I can't stop finding great new ones to add to my collection. If there's one thing I could say that kbeauty has done for me, it's really caused me to focus on moisturizing. Sheet masks have been a wonderful way to keep my parched skin happy and all the gels, serums, emulsions, gel creams and waterdrop moisturizers have kept my skin clear and glowing for awhile now. I love it. If you're looking to get into the world of Asian beauty, this is a great place to start. You'll learn a little bit about the different kinds of moisturizers, sunscreens, ampoules and a bunch about crazy ingredients like sythetic snake venom and snail secretion filtrate. It's been a LOT of fun! Sign up for The 3B Box here! Get your own dose of Asian beauty monthly.